Hi Everyone! I posted a workout video on to my YouTube channel of a shoulder workout that you can do from home. I wanted to compliment it with this blog post. The exercises are listed below along with the link to my video. Front Raise: Start by standing with a pair of dumbbells resting on your thighs, palms facing down. Lift your arms with the dumbbells in front of you. Make sure that you have a slight bend in your elbow. You are going to raise your arms until they are parallel with the ground. Pause for a moment at the top. Then slowly lower the dumbbells back down. Repeat 3 sets of 15. Side Raise: Start by holding the dumbbells by your sides, with your palms facing you. You are going to raise your arms until they are parallel with the ground. Pause for a moment. Then slowly lower the dumbbells back down. Repeat 3 sets of 15. 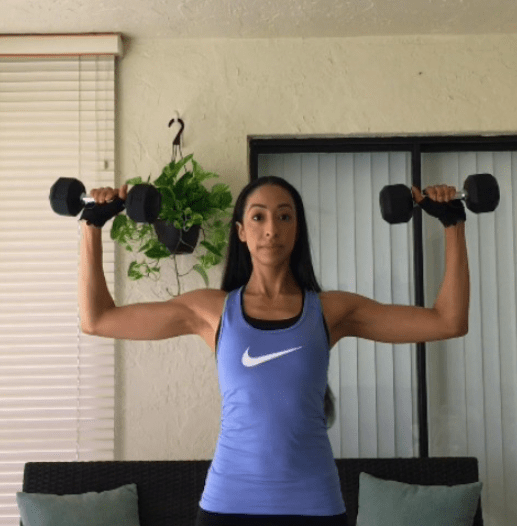 Shoulder Press: Start with the dumbbells at shoulder height on either side of you. Make sure that the palms of your hands are facing forward. Push the dumbbells up above you until they barely touch. Pause. Then bring them back down slowly. Repeat 3 sets of 15. Arnold Press: This exercise is named after Arnold Schwarzenegger for how he use to do it. It is very similar to the seated dumbbell press. The only difference, is that you start by holding the dumbbells with your palms facing you. In front of your shoulders. As you proceed to push up you rotate your wrist to where the seated dumbbell press starts. Push the dumbbells up above you until they barely touch. Pause. Then bring them back down slowly. Repeat 3 sets of 15. Seated Rear Delt Raise: Start by sitting down. Bend your body at the waist leaning forward while holding the dumbbells behind your calves. Lift the dumbbells straight by your sides until both arms are parallel to the ground. Pause and hold. Then slowly lower the dumbbells back to where you started. Repeat 3 sets of 15. Good video and I love that I can do it at home with my tiny 5 lb weights.